Migraine headaches can be terrible. The pain, vision problems (including aura), nausea, etc. can be debilitating; especially if they stick around for hours or even days. Migraines affect about 15% of adults, so they’re fairly common. And, while the exact cause is not known, there are lots of known triggers. Many foods and drinks are common triggers of migraines. You may have noticed certain foods, and drinks trigger your migraines. Sometimes the migraine comes on within an hour of the food/drink. Other times it may happen several hours, up to a day later. Avoiding these triggers can help. One of the main ways these foods and drinks trigger migraines is by their action on the blood vessels in the brain. When the brain’s blood vessels constrict and then dilate (widen), this seems to cause migraines. Many of the foods I’m listing below affect the constriction and dilation of blood vessels during a migraine. If you or someone you care about suffers from migraines, this post lists common triggers. Avoiding these can be a great tool to reduce these uber-painful headaches. You may be sensitive to one, or many of these foods/drinks. They act as migraine triggers in some people, but not all. You can find out by eliminating them and see if avoidance helps you. The first food that commonly triggers migraines is hard cheese like cheddar and Swiss; this is because they contain “tyramine” which is from an amino acid in the protein found in cheese. Other foods high in tyramine include those that are aged, cured, dried, smoked or pickled. These include sauerkraut and tofu. The second common migraine-triggering foods are cured or processed meats. Things like hot dogs, lunch meats, and bacon are in this category; this is because of their nitrates and nitrites that can dilate those blood vessels in the brain. Even if these are not a trigger for you, it’s best to eliminate them from your diet because of other health issues they’re associated with like colon cancer. I wish I had better news, but the third common migraine triggering food is chocolate. The evidence is conflicting, as some studies show a link and others don’t. You may or may not be sensitive to chocolate’s effects on the brain; you have to eliminate it to find out. 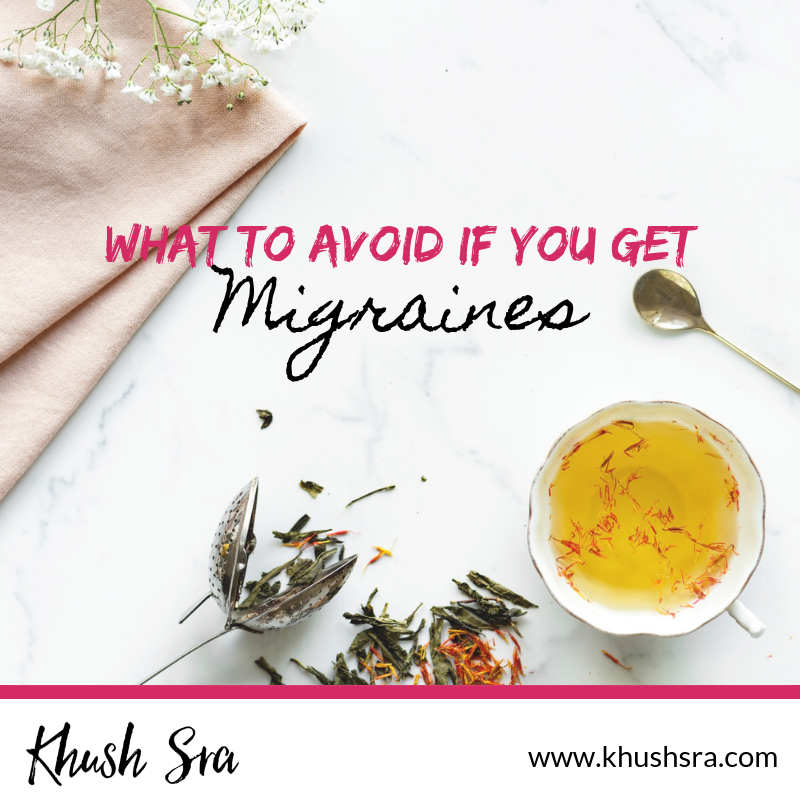 Artificial flavours like monosodium glutamate (MSG) also trigger migraines. MSG is often found in Chinese food and is a common migraine trigger. There is not a lot of research on this, but it’s something to consider eliminating from your diet to see if it makes a difference. Alcohol is a common trigger for headaches and migraines. Red wine and beer seem to be the most common culprits. We’re not sure why, but it may be red wine’s compounds such as histamine, sulfites, or flavonoids. Ice and ice-cold water have also been shown to trigger headaches and migraines. So try not to eat or drink things that are too cold. Artificial sweeteners like Aspartame are another common trigger. Aspartame is in diet sodas and other processed foods to make them taste sweet without adding sugar. As with MSG, there is not a lot of research on its effects with migraines. But again, it is something to consider eliminating from your diet and see if that makes a difference. There are many common food/drink triggers for migraines. Maybe one, or more of these trigger migraines for you. The best way to know is by eliminating them from your diet for a few weeks and see how that works. The list includes hard cheeses, processed meats, chocolate, alcohol, ice water, and artificial flavours and sweeteners. Do any of these trigger migraines for you (or someone you care about)? Let me know in the comments below. Steep mint leaves (or tea bag) for 5-10 minutes. Tip: Let the tea cool down a bit before drinking it.